One of the biggest unexpected challenges we encountered was how to move a 325 lb vanity up three flights of stairs by ourselves. 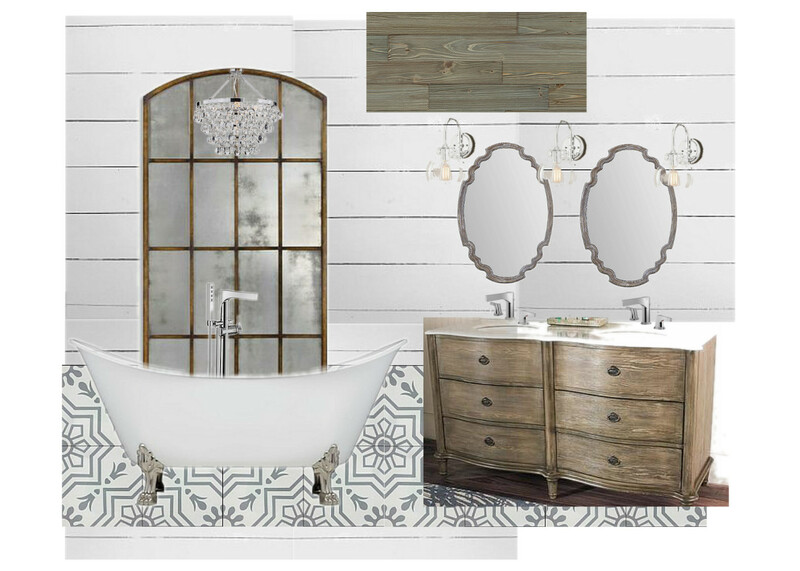 When I was sourcing items for our bathroom, I had my heart set on a cast iron clawfoot tub. We had one in our home when we were newly married and I loved it. 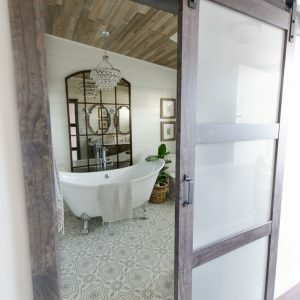 The weight of a cast iron tub is around 300 lbs and the hubs said no. No problem. I would compromise and buy the 100 lb acrylic tub instead. Problem solved! 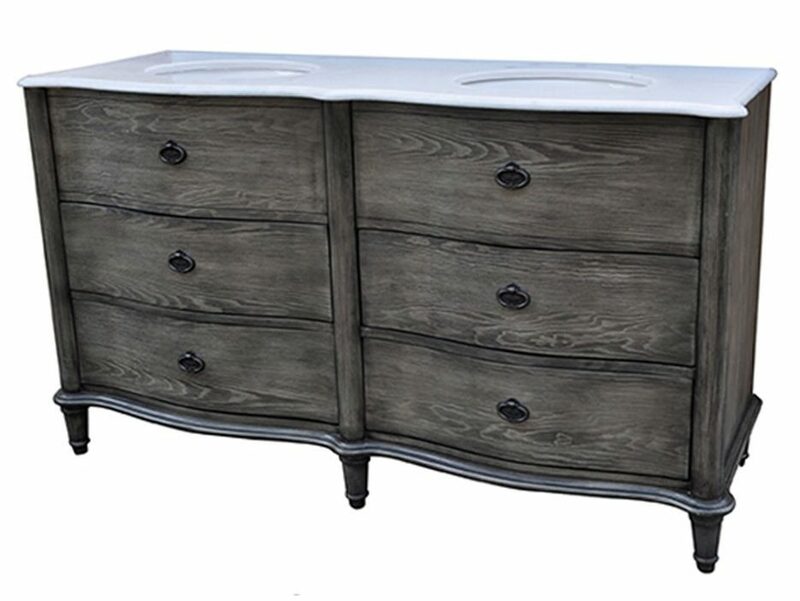 But I failed to look at the weight of our double vanity when ordering! Oops. It was 325 lbs of marble and wood and the top (the heaviest part) was not removable. I did what I always do when I’m not sure how to do something—Google it! 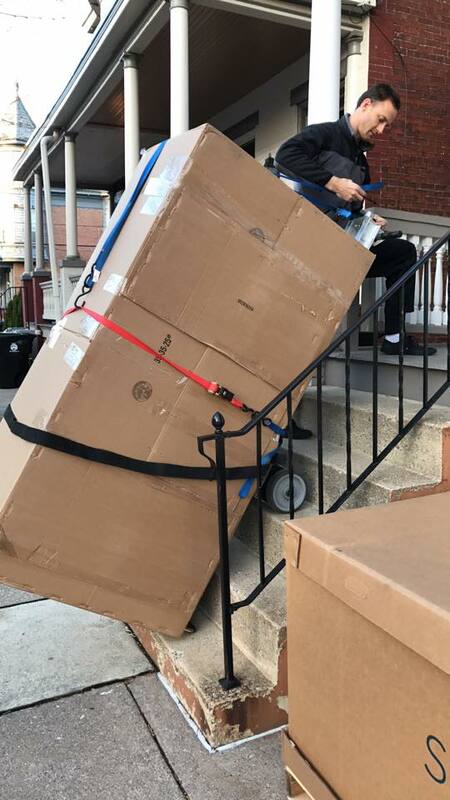 I searched online using the question “how to move heavy items upstairs by yourself“. In my search results I found articles telling me to spread dishwasher detergent on the floor to decrease friction  , use moving blankets and drag the item up the stairs, create a pulley contraption at the top of the stairs and slide it over a DIY plywood ramp, and all sorts of other tips that didn’t seem practical for our situation. I switched my search to YouTube and found a video of a motorized trolley that climbs stairs with a press of a button. Yes! This looked promising. Another quick search showed me that such a device costs around $4000 to purchase. Gah! I searched for local tool rental places near me and found Sunbelt Rental. They have locations all over the country, and offer a huge selection of tools. 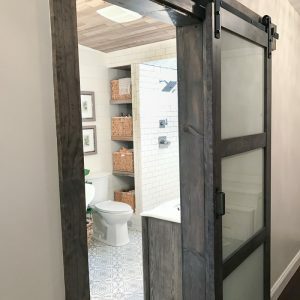 You can also rent power tools from Home Depot, but I found Sunbelt to be an amazing resource for unusual tools you might need. We rented the PowerMate motorized stair climber which can manage weights up to 650 lbs. It cost us $100 for a day’s rental and the rental process was hassle free. 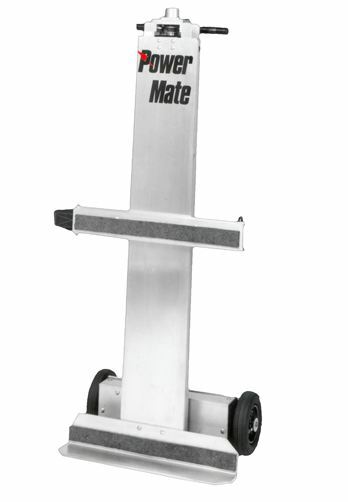 To use the motorized hand truck, you strap your heavy object securely onto the dolly and press a button on the top of the machine to lift the wheels up to the next step. Matt moved our vanity by himself, but for awkwardly large and heavy loads, I recommend having at least one other strong spotter. We did have difficulty with our very narrow staircase, and I was very anxious watching my husband maneuver the machine by himself. The included load strap did not secure our load properly since our box was ginormous. 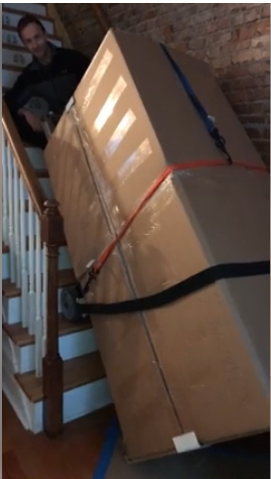 We solved this by anchoring the box with two other straps; however, after two flights of stairs and a mishap into the drywall (yikes! ), we removed our vanity from the box which made it so much easier to transport! 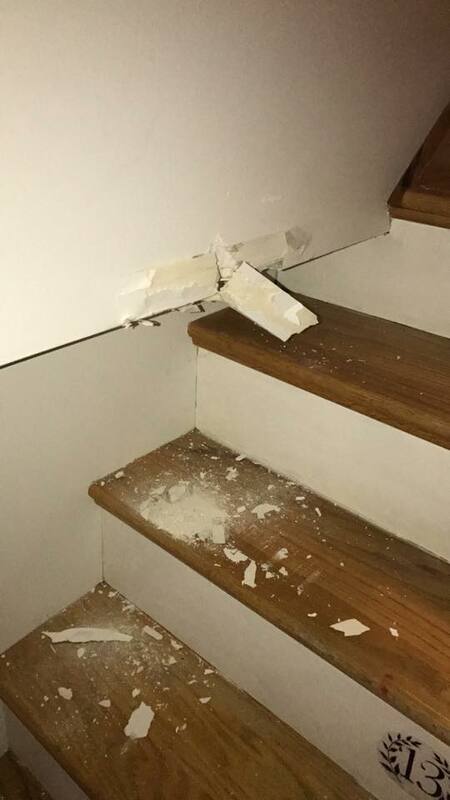 Of course the mishap happened on stair number 13! Ha! 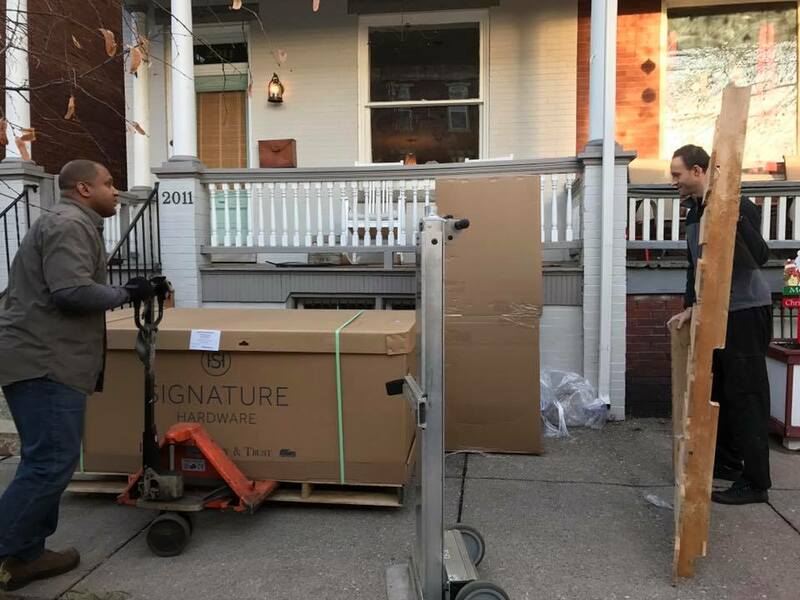 We were able to move our very heavy vanity with just one person, at a cost that was much less than hiring a three-man moving crew. My husband did want me to mention that moving the vanity took a lot of his strength and that he can deadlift 400 lbs. I don’t want you or your husbands hurting themselves! Even though the motorized dolly takes on a lot of the weight, there is still a lot of weight involved. 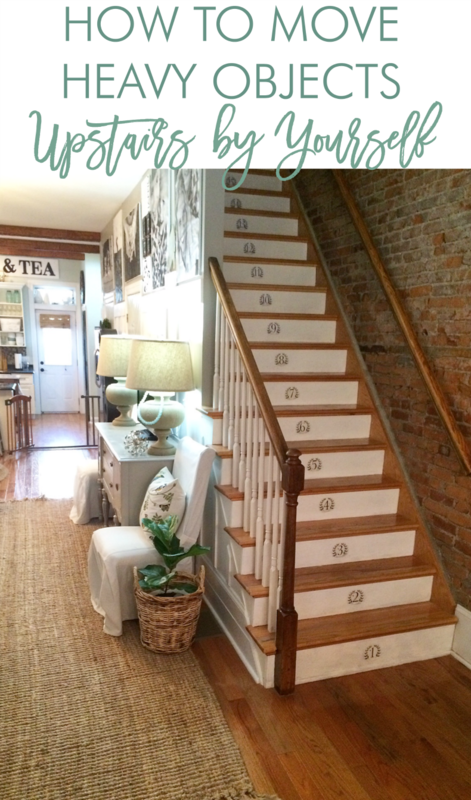 If your stairs are steep like ours, getting an additional strong person to help spot is best for safety purposes. Let me know if you try this method and how it works out for you!